A little bit about the photoshoot, this was done as realistic as possible without actually bleeding and getting hurt. We used fake blood of course but also vegetable oil to stain the shirt, as well as chocolate sauce to mimic dried blood. To get the flecks of mud on the face and rest of the body, we got a brush and dipped it into thick mud and flicked it so that little dots splashed on the face. I did a lot of rolling around in the river bed to get really nasty and dirty looking. It was fun and came out pretty good but at the end of the day I was happy to have a shower. Yeah, this was all mud for this shoot. I felt gross afterwards. 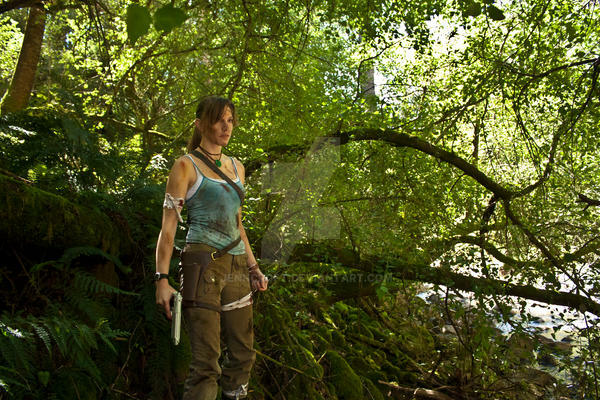 Wow at first glance it looks like a still from the game! Great work! the badass chick of them all! Dis-moi est ce que c'est toi qui à fais les holsters? this is great! did you make the holster? that is awesome. One question are you going a survivor image with a bow and arrow/cross bow because that would be epic? Yeah. I love that pic. Would be a great pose for Jenn. 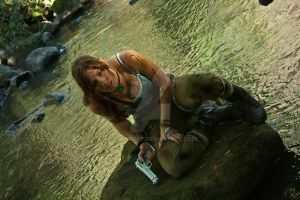 She look´s great as the new Lara!! Any photoshoot without actual bleeding is a success in my book. JENN YOU ARE FANTASTIC, NO WORDS CAN DESCRIBE MY HAPPY MOON NOW! will there be more pics? Yes there will be more. Thanks! Thanks everyone for the nice comments! 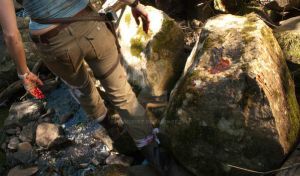 I just updated the photo description with a little info on how we obtained the rough look you see on Lara. More pictures from this shoot to come. Cheers! All the details in the outfit are great and the natural setting is just gorgeous! Amazing cosplay! Perfect outfit, make-up, pose, everything is great! I thought this was a screen cap great job Jenn !!! Jenn, this looks FANTASTIC! Just perfect! I was wondering if you'd do the redesigned Lara, and you pulled it off flawlessly. Really nice cosplay ^^ You make me feel like drawing new TR fanarts !! Do it! Your work is amazing and I want to see more. I'm sure everyone else does too. wow! It is amazing! This clothes are wonderful! Wow thanks!! I feel much obliged. You're amazing, Jenn! 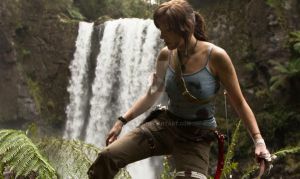 And you're the perfect Lara!